The engraver was D. Jenkins. Here is a truly lovely late eighteenth century print of Matlock Bath, which was engraved for and published in "The Modern Universal British Traveller". The buildings shown above the road centre right are the Old Bath Hotel. As Moore wrote in 1818 - "This is an extensive range of building ... where every accommodation will be found. Here are also assembly and billiard rooms for the amusement of the company. This is the primitive bath, and may be regarded as the nucleus, around which grew the present extended erections of Matlock Bath". When William Bray visited about 1778, at approximately the same time this engraving was executed, he wrote that "The bath is twenty yards above the river, and from the top of the rocks on the west side of the house is 120 yards perpendicular, where stand some small cottages" (Stonnis, not shown).The hotel's stables, later known as the Fish Pond Stables, were below the main building. The horses made use of the pond, which seems to have been referred to as the Old Bath Horse Pond. More stables were built at what is today the Fish Pond Hotel. We first hear of Robert Mason running the Old Bath in 1771 when there was an auction of "a substantial stone built messuage or tenement ... with about 8 acres ... under Great Masson. ... There are, on the premises, an exceedingly fine Spring, flowing abundantly with the hottest water, and also a Fine Cold Spring". It was here that Thomas Brentnall's Matlock properties were sold when he became insolvent in 1779, where shares in soughs and lead mines in various parts of the county were sold in 1782 and where in 1792 a General Assembly of the Cromford Canal Company was held. 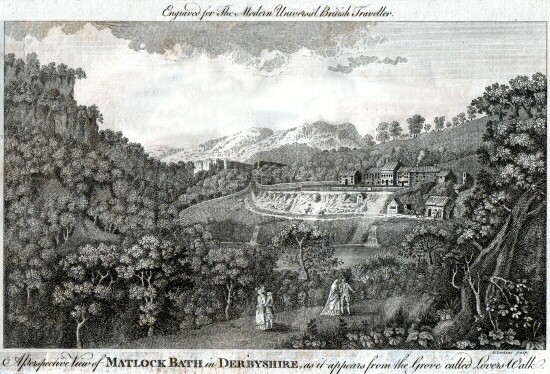 In November 1797 the Old Bath was "To be let for a term of years the well known and much frequented HOUSE called Matlock Bath ... now in the possession of Mr. Robert Mason who is about to retire from business". The last time we hear of Mr. Mason in relation to the hotel was in December 1797 when he had apparently declined business so a Mr. Carnelley from Sheffield's Tontine Inn announced that he would enter the premises about 2 Feb 1798. Whatever happened is not known but Mr. Leedham was managing the hotel in 1798. As for Mr. Mason, he moved to Cromford Bridgend where he passed away, aged 76, on 19 Aug 1810 and was buried at Matlock Church where he owned a pew. His wife Sarah survived her husband but died in 1813. They were survived by their son Horatio and daughter Mary Thornewill. The French Revolution and then Napoleonic Wars meant that people could not travel to the Continent, so tourism flourished at home. Illustrated guide books were produced to entice people to the various attractions within Great Britain. Matlock & Matlock Bath Tourist Guides, transcripts & illustrations. The guide "Beauties of England & Wales" (1802), Matlock, Matlock Bath and Matlock Dale discusses the discovery of the warm spring, etc. Matlock Public Notices & Announcements includes some notices about the Old Bath at this time. Deborah Bensted has very generously provided the image. It is taken from: "The Modern Universal British Traveller; or, A new, complete, and accurate tour through England, Wales, Scotland, and the neighbouring islands ..." The articles respecting England, by Charles Burlington, Esq. Such as relate to Wales, by David Llewellyn Rees, Gent. And those descriptive of Scotland, by Alexander Murray, M.A., etc. Published London: J. Cooke, 1779. Written, researched by an © Ann Andrews. Quotation from "Picturesque Excursions From Derby to Matlock Bath"
 Bray, William (1783) "Sketch of a Tour Into Derbyshire and Yorkshire" (Second Edition) London, Printed for B. White at Horace's Head, in Fleeet-Street. The first edition was published in 1778. "Derbyshire Advertiser and Journal", 15 January 1921. An article containing information from David Palmer Pearson. "Derby Mercury", 19 July 1771. Hot and Cold Springs near Matlock Old Bath, Derbyshire. See Matlock & Matlock Bath Names in the London Gazette. Eighteenth Century Entries : 1701 - 1800. Scroll down to the bottom of the page. "Nottingham Gazette, and Political, Literary, Agricultural & Commercial Register for the Midland Counties",19 March 1813 records the death of "Mrs. Mason, widow Mr. Robert Mason, formerly of Matlock Old Bath", aged 74. She was buried at St. Giles on 13 Mar 1813, aged 73 and was said to be of Cromford. See burial transcript.